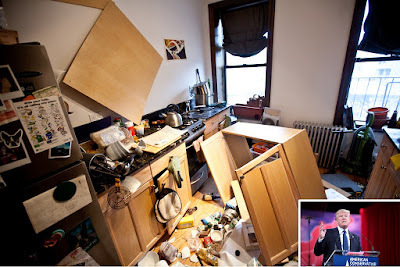 Trump fails to assemble kitchen cabinet set, quits project after nearly 20 minutes of causing irreparable damage. Kitchen cabinet set President-elect Trump failed to assemble. WASHINGTON (The Nil Admirari) - Earlier today, President-elect Trump took some time off from politics and went to one of his properties to help assemble a kitchen cabinet set. Trump confessed he wanted to do the project to "unwind," but after fifteen minutes it was clear he had failed to assemble the cabinets correctly and done irreparable damage to them. "I don't want to know how to do it correctly. I'm going to do it my way," said Trump at the beginning of the project.